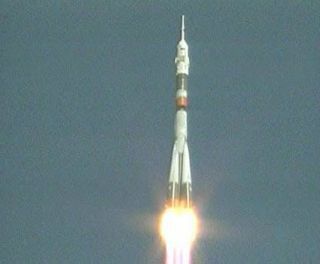 The Soyuz TMA-16 rocket launches from the Baikonur Cosmodrome in Kazakhstan, carrying Canadian space tourist Guy Laliberte and professional spaceflyers Jeff Williams and Maxim Suraev. This story was updated at 3:35 a.m. EDT. A Canadian space tourist and two professional spaceflyersrocketed toward the International Space Station Wednesday. The crewrode on a Russian Soyuz spacecraft that lifted off from Kazakhstan'sBaikonur Cosmodrome at 3:14 a.m. EDT (0714 GMT). Guy Laliberte, an acrobat and founder of the world-famouscircus troupe Cirque du Soleil, is making a 12 day visit to space. The billionaireperformer is devoting his mission to communicating water conservationissues. He plans to stage a poeticperformance about water from space on Oct. 9, while artists in 14 citiesaround the world take part in the performance through a simultaneous broadcast. "Guy said he's very happy," Soyuz commander MaximSuraev, a Russian cosmonaut, radioed from the capsule shortly after liftoff. "Everything is nominal onboard the Soyuz." Laliberte said traveling to space has always been a fairytale dream for him, and he hopes to send the message that fairy tales can cometrue. "The one thing I know is human people, children, youngkids, need inspiration to shape their future, to build their character,"Laliberte said Tuesday during a press conference. "And we have theresponsibility as adults to do everything in our power to inspire them." Laliberte reportedly paid about $35 million to the RussianFederal Space Agency for his seat aboard the Soyuz. The deal was brokered byU.S firm Space Adventures, which has arranged seven previous Soyuz touristflights. "We're very excited about Guy's flight," SpaceAdventures CEO Eric Anderson told SPACE.com Tuesday. "He's the firstperforming artist in space. He's going to be able to communicate what the magicof spaceflight is, and he's dedicated his mission to highlighting the fact thatwe need to take care of the water we have on this planet, which I think is animportant cause." Also flying into space today are two career spaceflyers -veteran NASA astronaut Jeff Williams and Suraev, a rookie spaceflyer - set tobegin long-term stints on the InternationalSpace Station (ISS). Both will begin as Expedition 21 flight engineers;then in December Williams is scheduled to take over as commander of Expedition22. Their mission will be a busy one, overlapping with twovisiting space shuttle flights, another Soyuz launch, and the arrival ofnumerous unmanned cargo spacecraft to the orbiting laboratory. Expedition 21 isonly the second six-person crew to work on the space station - previous crewshad only three members. Williams and Suraev are set to dock at the space stationFriday at 4:37 a.m. EDT (0837 GMT). They will join four other Expedition 21crewmembers already onboard - Belgian astronaut Frank De Winne, Canadian SpaceAgency astronaut Robert Thirsk, Russian cosmonaut Roman Romanenko, and NASAastronaut Nicole Stott. The new arrivals will also briefly overlap withExpedition 20 cosmonaut commander Gennady Padalka and NASA flight engineerMichael Barratt, who are set to fly back to Earth with Laliberte Oct. 11. "I spoke with the crew on orbit - I know they're veryexcited," said Mike Suffredini, NASA's space station program manager,during a Tuesday briefing. "They're looking forward to seeing you. ISS isready to accept you gentleman. Good luck and Godspeed." When the new visitors arrive on their Soyuz, it will markthe first time that three of the Russian spacecraft are simultaneously dockedat the station. The total will drop down again to two when the space touristand two out-coming station crewmembers fly home next week. Between research and station upkeep, the new crewmemberswill have their hands full once they arrive at the crowdedoutpost. "We always perform experiments," Suraev saidTuesday. "For our increment alone, we have about 50 experiments planned.We also have maintenance and repairs in case equipment has failed." Indeed, current crews aboard the station will be spendingmore of their time than ever before on research, now that there are so manyhands on deck to help with daily tasks and the bulk of the work building thestation is already done. "This is a transition between the assembly of the spacestation and transitioning into the full utilization of the space station asthis international orbiting laboratory," Williams said. It won't be all work and no play, though. For his part,Laliberte plans to use his status as space clown to lighten the mood in orbit.He is toting along a signature red clown nose to wear, and has also threatenedto tickle his crewmates and stage practical jokes. "I'm going there with my sense of humor, my belief thateven if some times in life we have to do hard work and serious work, there'salways a little space to keep humor present somewhere in daily life," hesaid. Williams and Suraev are set to return to Earth in March2010. SPACE.com is providing fullcoverage of the launch of Laliberte and the Expedition 21 crew with StaffWriter Clara Moskowitz in New York. Clickhere for mission updates and live mission coverage.